ESF held this event in Bixby on June 18th through 20th Our first day was visited by Tropical Storm Bill, who dumped rain on us all day. We filled up the 24 foot rental truck., this got us enough material for our next shipment to Dallas, which is scheduled to go out Friday June 26th. http://apps.irs.gov/app/eos/pub78Search.do?ein1=47-1034524&names=&city=&state=All…&country=US&deductibility=all&dispatchMethod=searchCharities&submitName=Search See there it is, the IRS now confirms we are a 501C3 organization and that donations are tax deductible. We’ve actually been that way for 6 months, but it’s nice to have confirmation available. Now we have to kick our fundraising and marketing efforts into high gear, else we’re likely to end up bankrupt and without a warehouse in the near future. It has come to our attention that the IRS never updated their business masterfile in regards to Electronic Synergy Foundation’s 501C3 Charitable Status. This has caused us a great deal of difficulty, especially in holding conversations with potential donors. We have contacted the IRS and the problem has been resolved. Sometime in late June/Early July, the IRS will release a new database and our confirmation status will propagate to other databases. Saturday April 25th, 2015 10 AM to 2 PM The city of Owasso holds this disposal day for their citizens. Provided are dumpsters where you can disposa of your unwanted stuff.. ESF was there to make sure that no ewaste made it into the dumpster. 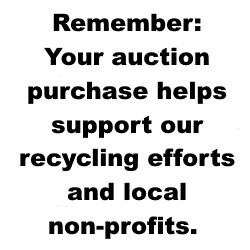 As a result of our collection efforts, 3732 pounds of eWaste were diverted from the landfills. On an interesting side note, i’m not sure why we ended up with this many vacuums, but they too can be recycled. On March 25th ESF loaded 19,000 pounds of ewaste onto a truck headed to a R2 facility in Dallas Texas. This material was collected mostly from our Broken Arrow and Jenks collection events. We are working on our April collection event, more details will be announced once they are finalized. Yesterday we completed moving in to our new processing facility. It’s tucked away in the north west corner of Tulsa. We will announce it’s location in the near future. For the next week or so , we will be working to get it ready for the public. In other good news, it looks like we will have a subsidized disposal channel for televisions. This means we can recycle them without charging fees. Our Synergy is growing!